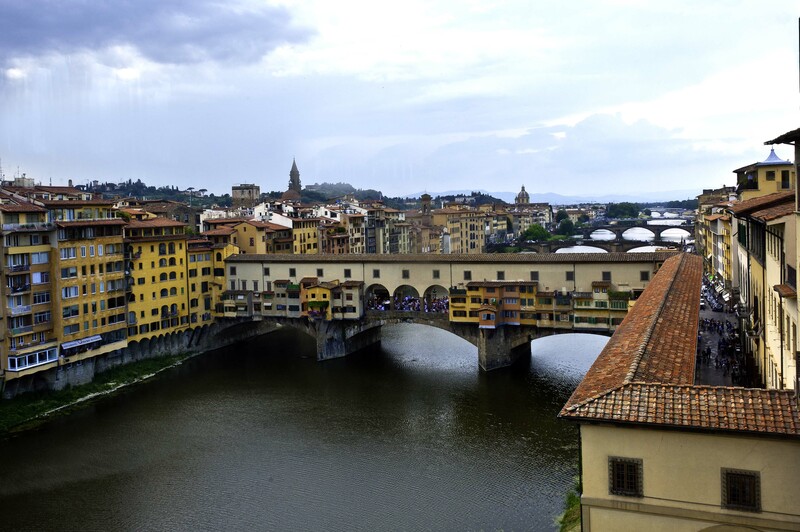 While in Cortona, Tuscany, we spent a day in Florence. Florence was a busy, but beautiful city where I could have easily spent a week exploring. A couple of the highlights were the Ponte Vecchio (“Old Bridge” in Italian) and the Duomo di Firenze (Cathedral of Florence). A few of the many images I took while in Florence follow. The Ponte Vecchio (“Old Bridge” in Italian) dates back to 1345, and it’s the only bridge in Florence that was not destroyed by the German troops when they retreated in August 1944. What makes Ponte Vecchio so interesting is that it holds many shops, just like in the old days. When the bridge was first built, most of the space was occupied by blacksmiths and butcher stalls, but they were eventually replaced by jewellers by order of Ferdinando de Medici. 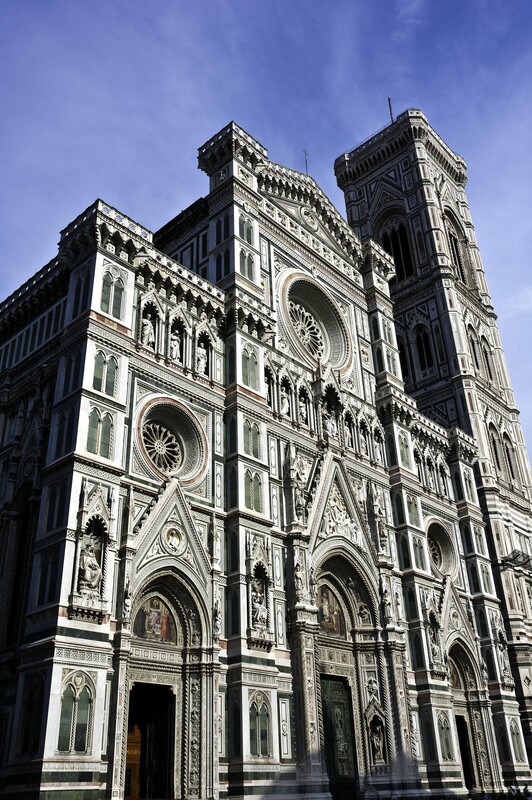 The Basilica di Santa Maria del Fiore (English: Basilica of Saint Mary of the Flowers) is the cathedral (Duomo) of Florence. 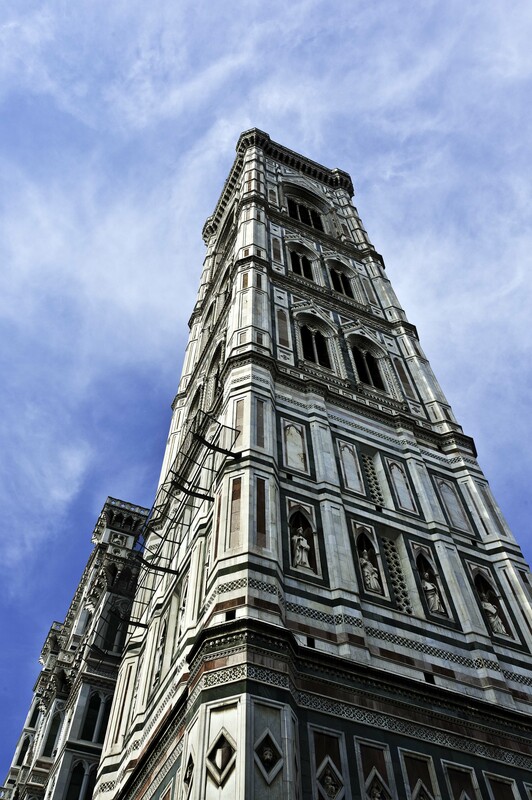 Construction of the Gothic style Duomo began in 1296 and was completed in 1436. I have many other images of the Old Bridge, Duomo and other sights in Florence and will eventually get them on this blog or on my Website. My time was limited this evening and, therefore, I was only able to include the above three images. Your vantage point for the Ponte Vecchio is great … you must have been on the second floor of a building not too far away. I tried getting a few shots of it from the river bank about a block away. Very hard to capture it all from that angle and get it all in. The photo is great because you can clearly see all the different shops and how they even hang out over the river and see the throngs of people shopping there, too. Wasn’t the Duomo the most amazing cathedral? (BTW where is the “dome?” Did you walk up the outside of the church to the top?) The many different colors of marble on it just blew me away and your photos capture all the different shades. I love the angle of these 2 photos as they depict the church from the viewpoint of a “mere mortal.” Can you imagine what a peasant from the 1300’s must have thought while gazing at this structure which must have been seen from miles away? Can’t wait to see what other photos you took … too bad you only had one day there. I’m totally speechless, these are so beautiful. It’s so impressive that you had only a day there and yet managed to get so much information to go with your “BEAUTIFUL’ photos. Thanks for sharing.